What are your company’s skills? Our company has developed and clinically validated a novel way of continuously tracking everyday function, which can lead to early diagnosis and treatment of neurodegenerative diseases, such as dementia or Parkinson’s. Our patent pending platform uses mobile phone based Augmented Reality exercises and kinetic patterns tracking in order to create a motor signature of dementia. 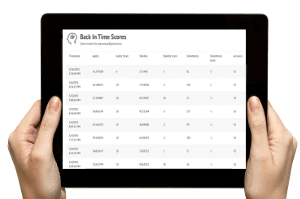 We are disrupting healthcare diagnosis by providing an accurate, reliable, easy, fun and cost-effective way of behaviour tracking and dementia prognosis 2-3 years in advance. Tell us about one of your the emblematic accomplishments? Our clinical evidence were published in the most high-impact journals, e.g. Alzheimer’s & Dementia Journal and our awards and recognitions include: Novartis Healthy Aging Fellowship 2014, White Bulls finalist 2014, Really EPIC Ventures competition USA 2014, Impact HUB Social Venture disrupting healthcare 2013, Call to Innovation award 2013, iENA tradefair for novel ideas, concepts, products 2013, EU Archimedes award 2003. We recently got a letter of support from Alzheimer’s Society Europe and a collaboration with a German tele-healthcare provider for the further support and development of our technology. What is your next stage of your development? We are still at an early stage, just spun-out from University at Jan 2014. However, as the immediate next steps we see an investment to the design and « look&feel » of our technology. Furthermore, we are focusing on piloting our solution to the top Memory Clinics and Nursing houses in Europe. Our focus at the moment is B2B, aiming at health reimbursement.